Looking for interesting places to visit in New Brunswick this year? Bordered by Quebec Province, the Province of New Brunswick Canada is perhaps most famously known for one of the most amazing natural phenomena - the Old Sow Whirlpool – one of the largest tidal whirlpools in the world. New Brunswick is certainly an outdoors enthusiast paradise boating pristine forests and peaks such as Mt Carleton, the highest peak in the Maritime provinces. Apart from outdoor pursuits, New Brunswick boasts a cultural heart – Fredericton – where you’ll find many cultural attractions such as museums, historic buildings such as the Old Government House, and festivals such as the annual Harvest Jazz & Blues Festival. First on my list of interesting places to visit New Brunswick it's the city of Saint John, located on the southern coast. Here, you'll find the - Carleton Martello Tower National Historic Site -a great tourist attraction to visit because of the magnificent views you can get of the bay and Nova Scotia in the distance. At the tower, you can arrange an interesting tour and learn more about the history of the tower during World War II. If you’re traveling with kids and are looking for family-friendly attractions in St John, you can visit the Cherry Brook Zoo and the Canada Games Aquatic Centre which has fun water slides. If you are also planning side trips during your vacation in New Brunswick, one popular Saint John day tip is visiting the beautiful Cape Chignecto Provincial Park in Nova Scotia. You can hop on a ferry from Saint John’s harbor for the channel crossing to Digby Nova Scotia and visit Provincial Park, which also boast an interpretive visitor’s center. Grand Manan Island is a great spot for enjoying wild life spotting and it’s on my list of interesting places to visit in New Brunswick because of the whale-watching opportunities. Grand Manan Island is one of the best spots for experiencing amazing whale sights such as Humpback whales and Finback whales, and you can either hire a fishing boat to get up close and personal, or enjoy whale watching spotting from the soaring cliffs. By the way, you can reach Grand Manan Island by ferry ride from Blacks Harbor, taking around 80 minutes sailing time. The Bay of Fundy spans the southern coast of the country, and one of the most popular natural attractions along the bay it's the Hopewell Rocks (pictured). 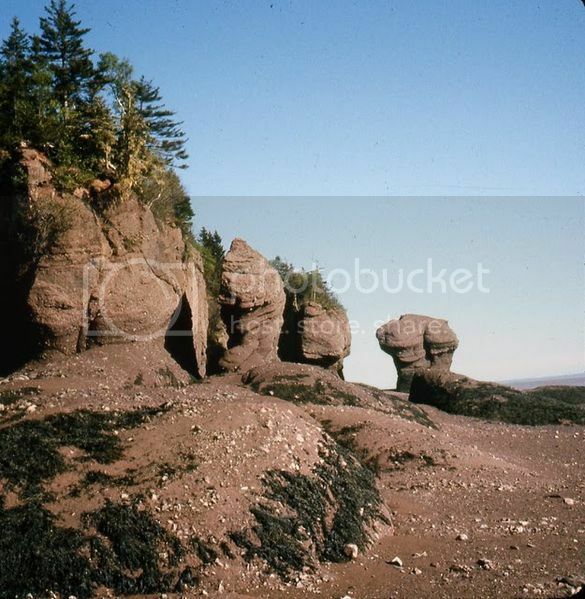 Hopewell Rocks is one of the most interesting places to visit in New Brunswick because of the interesting tidal range phenomena that occurs at low and high tide. Hopewell Rocks also boasts pristine scenery and stunning rock formations such as the famed Hopewell Rock formations, which are rocks shaped by the tides in the form of “flower pots”. Not far from the Hopewell Rocks, you’ll also find the beautiful Fundy National Park where you can do hiking while enjoying nature sightseeing such as waterfalls scattered throughout the park. The capital of Fredericton is also a great place to visit on a day trip, or base your vacation in New Brunswick, especially if you’re looking to enjoy city activities like visiting museums and art galleries such as the Beaverbrook Art Gallery and the York Sunbury Museum. Fredericton is also on my list of interesting places to visit in New Brunswick because of the changing of the guard ceremony at Officer’s Square. If you’ve seen the changing of the guards at Buckingham Palace in London in England, or the changing of the guards at the Stockholm Royal Palace in Sweden, you’ll enjoy seeing the beautiful display of the Canadian Armed Forces re-enacting a drill ceremony. The Old Sow Whirlpool is located near the Maine-New Brunswick border and it is one of the most interesting places to visit in New Brunswick for sure. If you’ve never seen a whirlpool before, you’ll be blown away by the Old Sow, as you watch the vortex swirling and bubbling water. The Old Sow Whirlpool is located off the coast of Deer Island NB, and you can also be reached by ferry from Eastport in Maine. If you’re a hiking enthusiast looking to do many outdoor pursuits, be sure to add Mount Carleton Provincial Park to the list of interesting places to visit in New Brunswick. The park is great for backpacking and hiking as it boasts many different trails to suit all levels and plenty of wilderness. You can also do fauna and flora spotting as well as enjoying wilderness camping, though the camping sites here are primitive camping so no hook ups.